Need a knife that can do it all and a $1400 price doesn't bother you? I don't know if you can find anything with more tools then this Wenger Giant Knife. 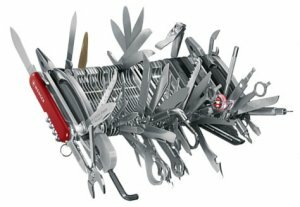 With an astounding 87 implements you could spend a lifetime trying to figure out what each tool is, and what each tool can do. It weighs 2 pounds, and sizes in at 8-3/4 inches, so you will need large pockets, and a strong belt to keep your pants up. There are too many tools for me to list, so you can find the full list on the Wenger Giant Knife page.